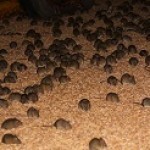 We can control/exterminate and prevent home infestation of mice, and rats. Rodents are of great concern because of their unsanitary nature. They also do not mind if you keep a clean home, they will invade any where to find shelter or food. Our Pest control serves offer several different ways to control and monitor rodents. We can install bait stations to eliminate and monitor the rodents. Or we can install live or snap traps to eliminate them. With the bait station we would install and monitor the amount of activity to determine how many rodents are around your home. With this knowledge we would schedule monitoring and rebaiting at necessary intervals best for the amount of activity found.